This KIND giveaway is the gift that keeps on giving! Not only have the BOY and I been living on (and loving) both flavors of granola bars, this fresh granola is addicting! Keeping granola in the house is always dangerous for me…I just love the stuff! 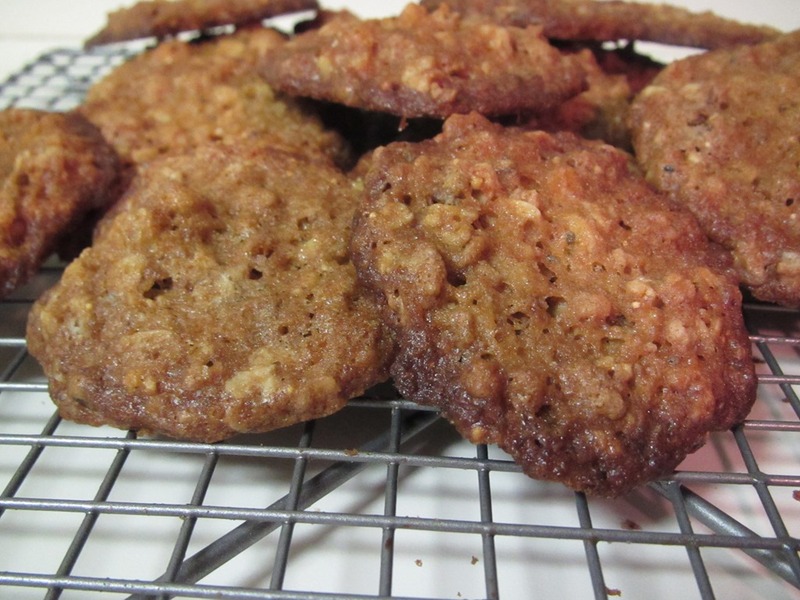 While I was digging into a bag by the handful, I remembered a granola cookie that my Mom and I made many years back. I found the recipe buried away in my recipe scrapbook (it was copied from the Daily Herald, I think). 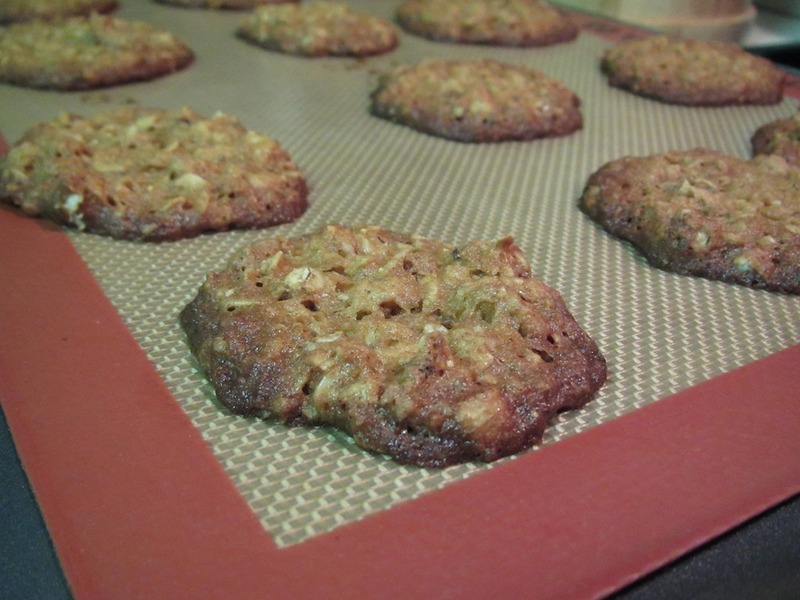 It’s a simple cookie recipe combing oats, granola, and walnuts. I remember the first time we made this was with apple cinnamon granola. Great idea! I was excited to try it again with this dark chocolate cranberry granola. As I was about to start scooping out dough, I reread the directions to discover that I needed to refrigerate it for 2 hours. Meanwhile, I was able to get to work on making one of my favorite soups. The time flew by because I had television to keep me company, but I was more than ready to get baking after dinner. These cookies are lacey and they will spread, so give them room on your cookie sheet. And then let them cool for 10 minutes before transferring. The BOY commented that he thought these cookies were ‘dry’, so I feel I should warn you that these are supposed to be a crispy and crunchy lace cookie and not as soft as your typical chocolate chips cookies. Heat oven to 350 degrees. Line baking sheets with parchment paper. 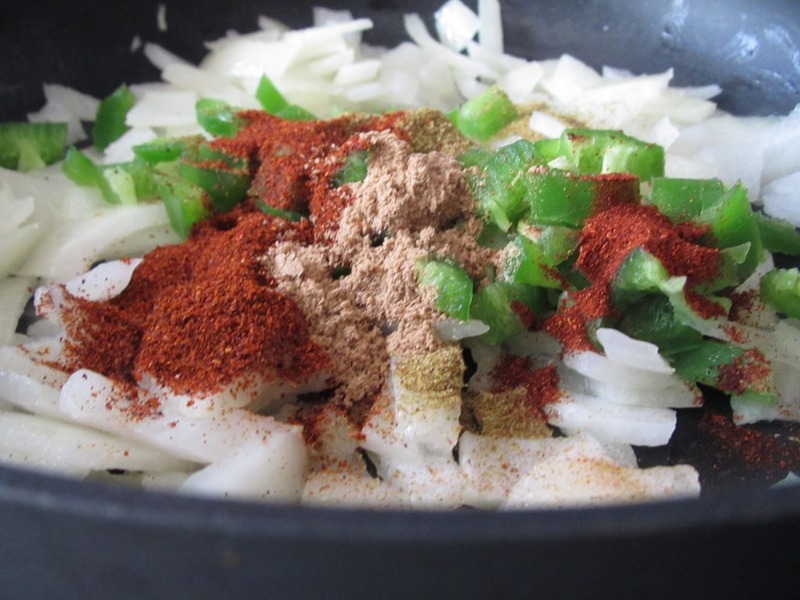 In small bowl, stir together flour, baking powder, soda, salt and spices. Set aside. In large mixing bowl, cream butter, shortening and sugar on low speed for 30 seconds. Add eggs and vanilla. Beat on high speed 2 minutes until light and fluffy. Scrape bowl well. Add flour mixture and beat on low speed just until combined. Scrape bowl well. Add oats, granola and walnuts. Mix on low speed 30 seconds. Scrape bowl well. Chill dough at least 2 hours. 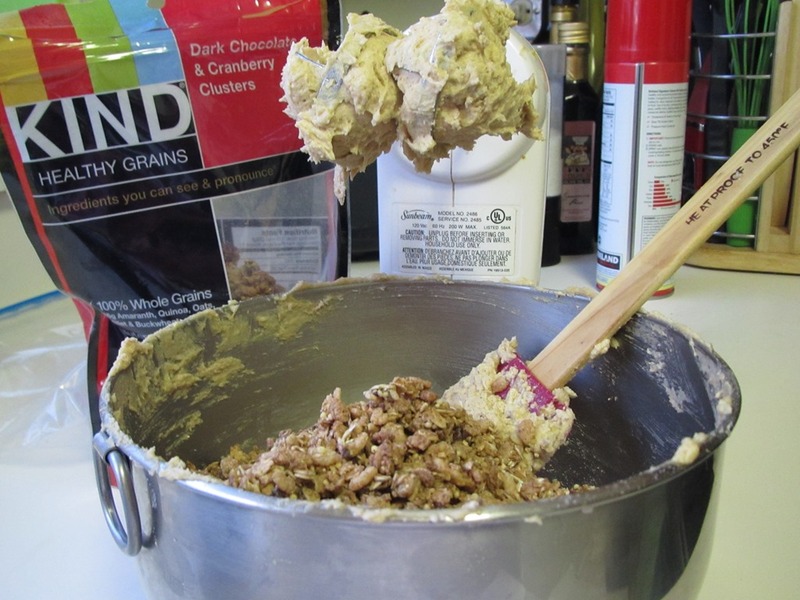 Scoop dough into small 1-inch balls and place 2 1/2 inches apart on lined cookie sheets. Bake 15 minutes or until deep golden brown. Dough will spread while baking. Finished cookies are thin, textured and lacey. Cool on pans 10 minutes before transferring to wire racks. Store tightly covered. 81 calories, 4 g fat (1 g saturated fat), 10 g carbohydrates, 1 g fiber, 1 g fiber, 11 mg cholesterol, 40 mg sodium. And this is not just because I stayed up late to watch the fairly predictable Oscar’s last night. It all started Saturday morning when I had a slow start to the day, followed by a nap, before actually putting in my contacts at 1pm. I did hit the neighborhood for a 30 minute run. It was pretty slow and I felt like I was running with weights strapped to my ankles. I have no idea why I felt so tired. It’s possible that it had to due with a stressful week that lacked my usual hours of sleep or maybe I’m just coming down with something. For whatever reason, I was running on empty, literally! Sunday morning was Hot Yoga! This is always a challenging class, but this week my legs were shaking like crazy 30 seconds into chair pose. Although my balance poses were on, I was more than ready for child’s pose, stretching, and shavasana by the end. The rest of the day was laid back and productive. I had a lot to do around the house (yes, my pantry needed to be reorganized AGAIN) and a run down weekend is the prefect time for these types of activities. It’s no surprise that I didn’t wake up until my alarm went off this morning after more than 9 hours of sleep. I set it for 30 more minutes waking up a few minutes before I needed to get ready for CrossFit. I was a little nervous to go to this morning’s workout, especially when I found out that it involved burpees. I knew that I didn’t have 100% of my energy but I figured I would do the best that I could. Thankfully, the people I workout with are super supportive and there is great energy in the gym. I survived today’s WOD AMRAP 8 although at one point I thought I might fall over : ) I made it through the ~2 minute cash out (optional) workout too. When I got done with my workout, I felt strong but tired. I knew I needed some serious energy in the form of a refreshing smoothie. I recently saw a carrot and orange smoothie on Herbivore Triathlete that intrigued me. I didn’t have any fresh carrot juice, but thought that maybe my new blender could puree the carrots good enough to be a smoothie. On a whim, I threw in some kale. I had full intentions of adding ginger as well, but didn’t have time. I took one quick sip before packing up my smoothie to go. The BOY had an eye doctor appointment and I was going along to help him pick out new glasses. Meanwhile, I found some glasses of my own to try on. While I was keeping myself busy reading a magazine, I saw a similar smoothie (minus the kale) in Clean Eating Magazine. The best part is that it is supposed to boost energy. That’s exactly what I needed this weekend! When I’m feeling run down, it effects more than just my workouts. I don’t make wise decisions about snacking and my memory stinks. Looking to the week ahead, I am committing to catching up on sleep, eating well, and working out hard. Do you have weekends where you feel run down? How do you get energized again? -Chop carrots finely and then use your blender to puree. -Add oranges and blend to combine. -Add kale (and ginger if using) and blend well. Stream in almond milk to preferred consistency. 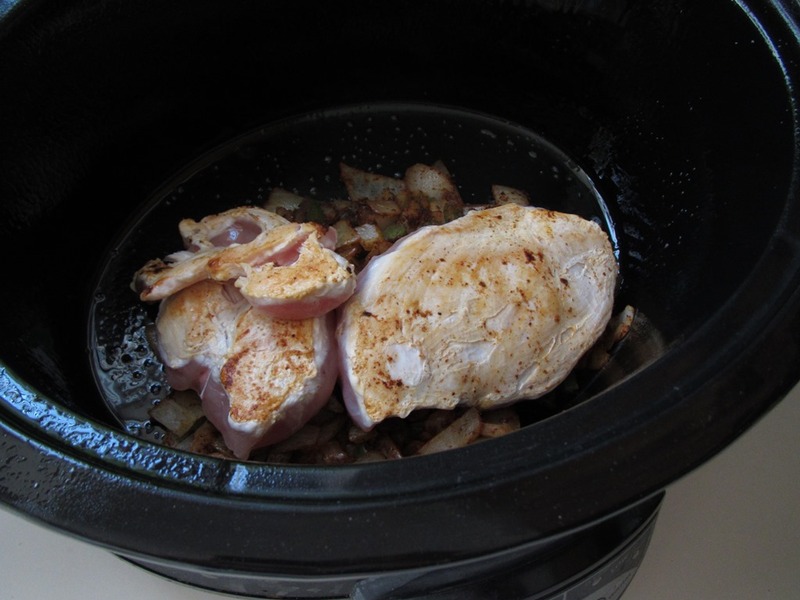 -Add ice cubes and process until smooth. Are you tired of breakfast yet??? I hope not because it really is the most important meal of the day! I’ve been working on perfecting this muffin bake with Take One and Take Two documented previously. There is nothing more fun than making and tasting all of these different breakfasts! Now, it’s time for Take Three, and I ran out of blueberries. Not to worry because strawberries make an equally enjoyable substitution! This time I used less flax and more oat bran which gave me a much cake-ier consistency, but still a warm gooey center. Of note…this breakfast is wonderfully robust and filling. However, I’m not going to pretend like this is as sweet as a muffin. I can tell you that I don’t miss the sweetness at all! Especially when topped with almond butter and a sprinkle of coconut. Another fantastic, healthy, and satisfying breakfast. The perfect way to start a sunny winter Sunday! Don’t have time to bake your breakfast? I just learned from FitCupcaker that you can make her recipe in the microwave! Stir together flax seed, oat bran, almond flour, baking powder, and salt. Add in almond milk, vanilla, and agave. Let cool and then top with your favorite additions! I need to take a quick break from the breakfast kick I’ve been on to properly honor bananas! Because…Today is National Banana Bread Day, and it is no secret that I am a HUGE banana bread fan! I mean, have you seen my Recipe Page. It’s overflowing with banana and banana bread recipes. 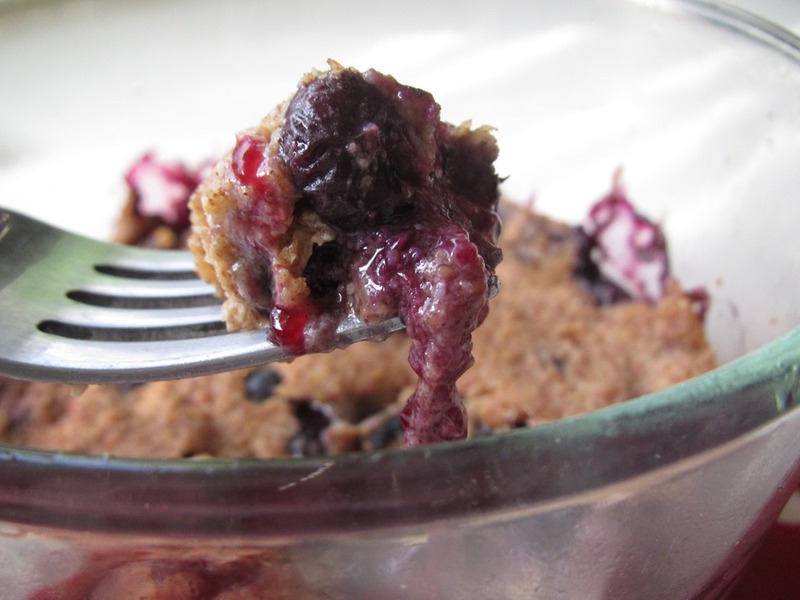 Cherry, Banana, Coconut Butter Bread from Oh She Glows! I think I should rename this blog 365 Days of Banana Bread!!! Did you eat banana bread today? What is your favorite banana bread recipe? I’m sure I could replace the word easy with lazy but easy just sounds better : ) In all honesty, it’s a pretty lazy morning. I didn’t sleep well this week, and was bummed to find myself awake before 8am this morning. I wasn’t ready to actually start my day, so instead I moved downstairs to the couch where I had some DVRed TV to catch up on. I know that there will be many summer and fall Saturdays that I will be up at the crack of dawn marathon training where I will miss EASY mornings like this one. And by summer, I hope to have mastered the Blueberry Muffin Bake. I made my first attempt earlier in the week and although this baked oatmeal was warm and filling, it wasn’t quite right. So I gave it another try this morning with a few changes. And boy did this one turn out better! 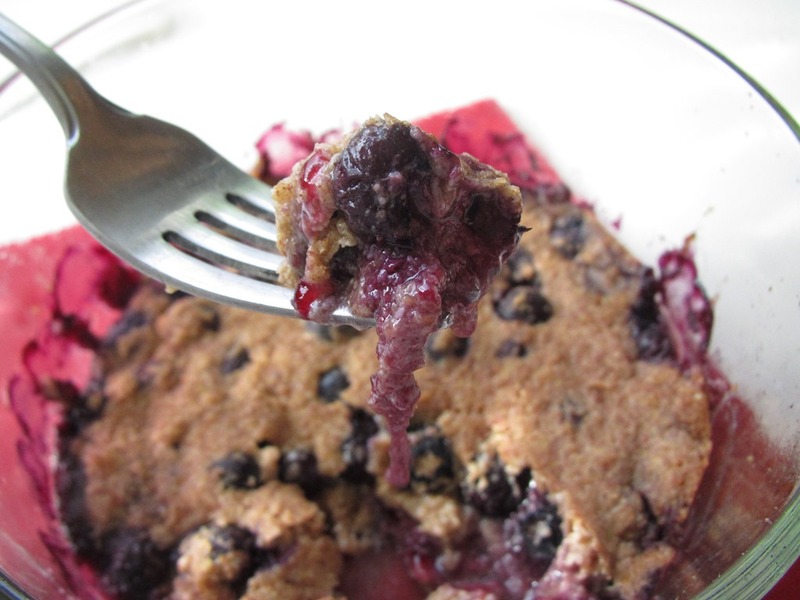 The blueberries were warm and gooey and although the center wasn’t quite set (perhaps I need more flour and less flax for Take Three), this breakfast hit the spot! 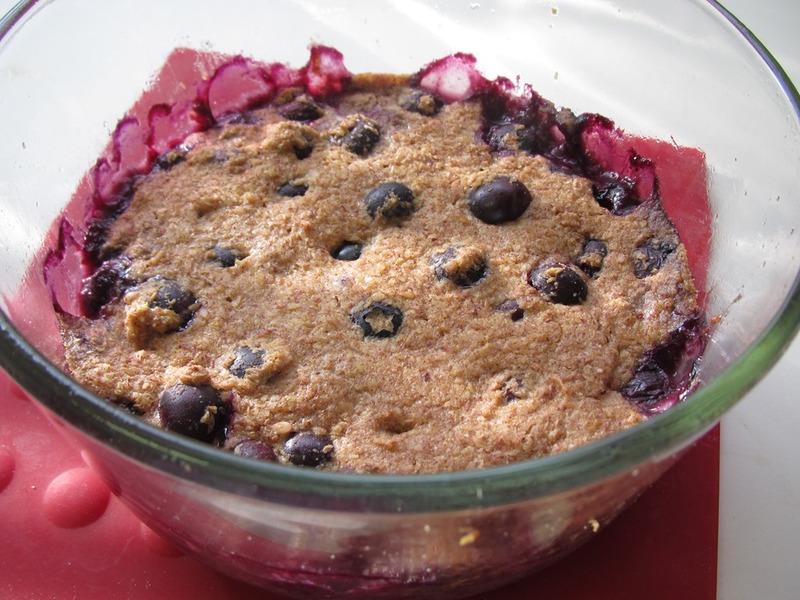 I covered the blueberry bake with tons of fresh berries. And this breakfast disappeared quickly! I hope you are having an EASY morning! Looking for a reason to stay on your couch, go check out this hilarious video of ‘Mom Dancing’ posted on my friend Michelle’s blog! Stir together flax seed, almond flour, baking powder, and salt. Add in almond milk, vanilla, and agave. Let cool for for a few minutes. Then cover with berries, nuts, coconut, and all of your other favorite toppings. Thursday morning used to be an easy morning to get up and out the door for a run or a gym circuit before arriving at work. Recently, my work schedule has changed and it is totally rocking my workout schedule, which I hate! I knew I wouldn’t have a lot of time Thursday morning for a workout and didn’t want to waste time with transit. As I was contemplating what to do (outside running was out with a windchill below zero), I remembered doing an awesome and quick home workout at the end of last year. I looked it up the night before so when I woke up, I could get right to work, no time for excuses. The workout was much harder than I remembered and by the 3rd round (7 reps each), I was sweaty and out of breath. I wish I had my HRM because I was curious to see how fast my heart was beating. After the workout, I concluded with a 2:00 minute plank before hopping in the shower and devouring my breakfast. Best home workout EVER! I’m still sore today! For breakfast this week, I have been living on this Chia Seed Breakfast Bowl. I totally could have made the double batch because I ate it again this morning. 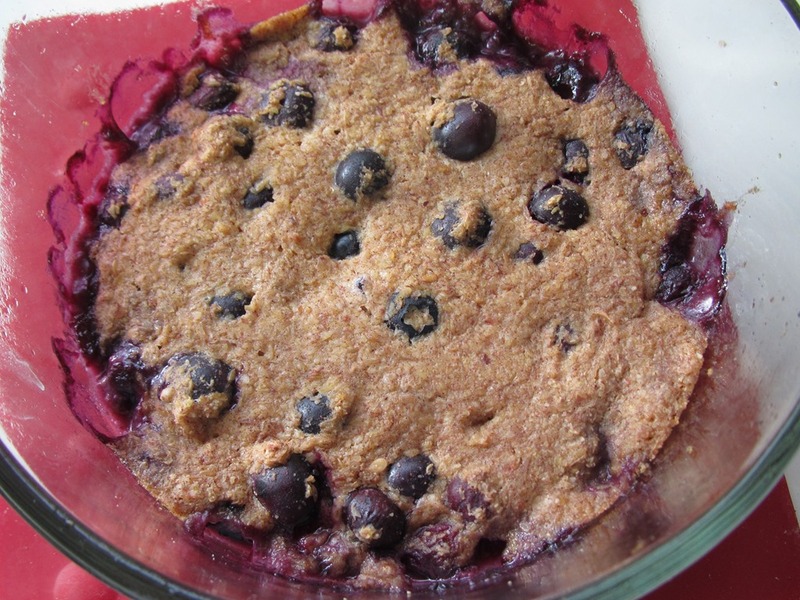 I changed up the recipe a bit and topped it with blueberries and almond butter. This is one incredible tasting breakfast. The best part is that after eating this at 7am, I was able to make it all the way to lunch at noon without a snack. That never happens! Has anyone tried the chia bowl? What do you think? What is your most filling breakfast? Adapted from Oh She Glows! Mash your banana well. Stir in the flax, chia, vanilla, cinnamon, and milk until well combined. In the morning, top with berries, granola, nut butters, etc.